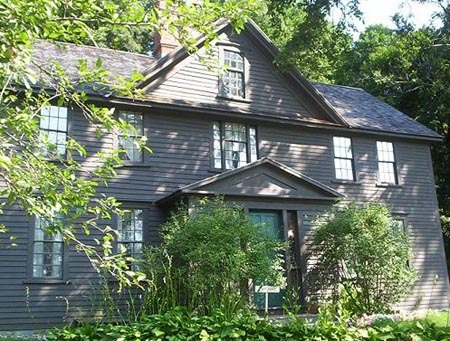 As someone who is from the area, I pass the girlhood home of Louisa May Alcott year round when I bring my youngest daughter to preschool off Meriam Road just beyond Orchard House. Since it is a part of my routine landscape, I have found it only mildly intriguing, usually when the film crews arrive on one or two occasions throughout the year. However, I chose to shake off the familiarity bred by one too many times up and down the same road and put myself in the position of visitor this past week so as to experience it from the inside out with my two daughters. I immediately was impressed at how they made the Alcott family come to life for their young visitors. In my particular case, I chose to enlist in a wonderful program called Hand-in-Hand. It is created specifically for girls four to six and draws them into what might have been the daily life of the Alcott children. At the same time it is fully engaging to the parents to tour each of the rooms and understand how it functioned for the family in that time period. The high point here was the fact that this audience of young girls were fully attentive and truly curious about the way these young women lived. The program itself was a combination of age-appropriate stories, fact finding scavenger hunts around the house, songs and questions and answers. I highly recommend it. The Orchard House is not a passive historical journey. The people behind the scenes have chosen not to fall into the trap of cliche or standard tourist fare. They have created a living and breathing adventure for young and old and I hope to go back at some point for the "Adult" tour.